Who is Robert Higgs? No economic historian working today has done more to untangle the intellectual mess that the welfare-warfare state made of the 20th century. Higgs has a keen eye for detail, a passion for deep research, a sound theoretical outlook, and a flair for writing that makes his prose white hot. His book Crisis and Leviathanwas a landmark but in many ways, his new book extends his model and goes beyond it. No other book so successfully dissects the relationship between the state/military sector, American industry, and macroeconomic performance. How prosperous was the US economy in the 1940s? Why did prosperity resume after the war? What happened to capital formation in a time of wartime planning? How did it happen that the US crawled out of wartime central planning by 1947? What were the true costs of the Cold War? How was the Higgsian notion of crisis used as an excuse for power during the Cold War? To what extent is the US corporate sector subsidized by the warfare state? How is public opinion related to US military spending? What happens when Congress wants to build weapons that the military doesn't want? If you have ever wondered how much of the official story of the last fifty years is correct, Higgs makes it clear: your worst suspicions are correct. The official statistics are little more than fiction. The level of corruption in the warfare state is egregious. The liberty and property taken from you in the name of "security" is just as objectionable as that taken in the name of "social welfare." 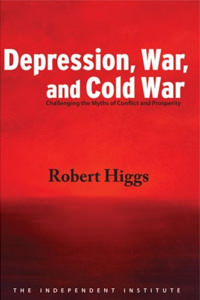 Higgs is the pioneer of the idea of the "Military-Industrial-Congressional Complex" or MICC, a variation on a theme that is more precise than the one first advanced by General Eisenhower. He shows how the executive and legislative branches work together to enrich favored corporations and keep the public whipped up in a state of frenzy. This is not, repeat not, the free market at work. And unlike many neoclassical economists, who are willing to overlook interventions provided that they benefit private companies, Higgs sees that transfers payments of all sorts, no matter who the winners are, ultimately cost society very heavily. Many trillions have been transferred into oblivion, and the nation has suffered as a result. In many ways, each chapter is a masterpiece of exposition and research. The footnotes and data are up to the highest scholarly standards: most of them were prepared for publication in professional journals. But the underlying radicalism is the flame that heats it up to become a supreme intellectual achievement.